For as much as I’ve transferred my comic consumption to the confines of my tablet, for some reason – likely an old fuddy-duddy kind of reason – I always need some extra prompting to get Infinite Comics, which is ridiculous because Infinite Comics are really cool. 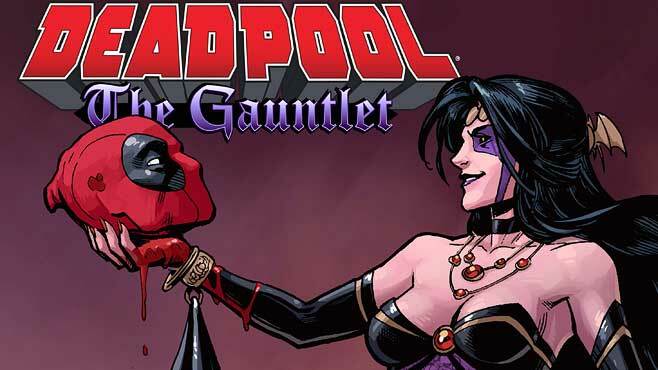 So when Marvel announced that Deadpool: The Gauntlet #4 revealed the mystery woman who will be marrying Deadpool in all Marvel’s hype, I backlogged and got all four issues, immediately regretting that I hadn’t done it sooner. There’s a tendency to assume Infinite Comics will be some one-off story that doesn’t matter, but regular Deadpool writers Gerry Duggan and Brian Posehn are not only tying this into their main book, but they are making full, funny use of digital format with great artwork from Reilly Brown. A character like Deadpool is a perfect fit for Infinite Comics, because you can plan out comic timing in advance, revealing each panel at the moment you want it revealed. So not only does it make the fight scenes more kinetic, forcing you to appreciate each panel one at a time, but you can do things like plot out an elaborate James Bond-style opening credits sequence, as the team does in The Gauntlet #1. This ain’t motion comics, but you can imply motion a lot more effectively with Infinite Comics. The four issues released so far tell the story of Deadpool, trying to distract himself from the recent psychological trauma of The Good, The Bad & The Ugly arc, getting hired by Dracula himself to retrieve a coffin carrying his bride-to-be for an arranged marriage that is supposed to bring peace to the monster underworld. He had to go fetch her casket from the Arabian Peninsula, fend off weird bamfing swordsmen trying to destroy it, then haul it through Greece and avoid an angry Minotaur on a scooter, after which it cracked open, and Queen Shiklah emerged. After trying and failing to kill Wade with a kiss, she tells her life story about being from a monster clan who fought with vampires for ages, and that she was sealed away in the casket to protect her from the war after her father lost two of his sons. Yet, they turn out not to be as dead as was expected, which means Dracula’s wedding to Shiklah will be moot (property matters and what-not, you know, the actual foundation of “traditional marriage”). Then again, it might not even happen anyway, because Blade is on the trail of Deadpool and Shiklah, who is actually a weird purple smoke monster Blade wants to kill. How this all leads to Shiklah (perhaps so named because there will be a lot of “shiksa” jokes on the horizon) marrying Deadpool remains to be seen, but The Gauntlet has been quite an entertaining adventure so far. Whether it’s referring to the Minotaur’s statue form as being a ‘pigeon toilet’ or getting an internal monologue from a zebra, Duggan & Posehn show theyv’e got the chops to keep Deadpool funny without making us groan or weary. Shiklah seems to have some sort of moral compass, and her monster form probably means Wade’s fugly face won’t be a hindrance to their rampant coupling. Brown’s art is snazzily arranged, allowing for some more visceral pacing that allows the story to unfold more methodically than it does for those of us who occasionally have a tendency to read everything first and not really register all the artwork until later. So if you have a computer (and reading this means you do), don’t be afraid of Infinite Comics. They’re actually really awesome, and Deadpool: The Gauntlet is a case in point.